Easy, vegan, peanut-ty, this authentic no-cook Thai Peanut Sauce is a great summer side! Its spicy taste and healthy ingredients make it palatable and nutritious at the same time. 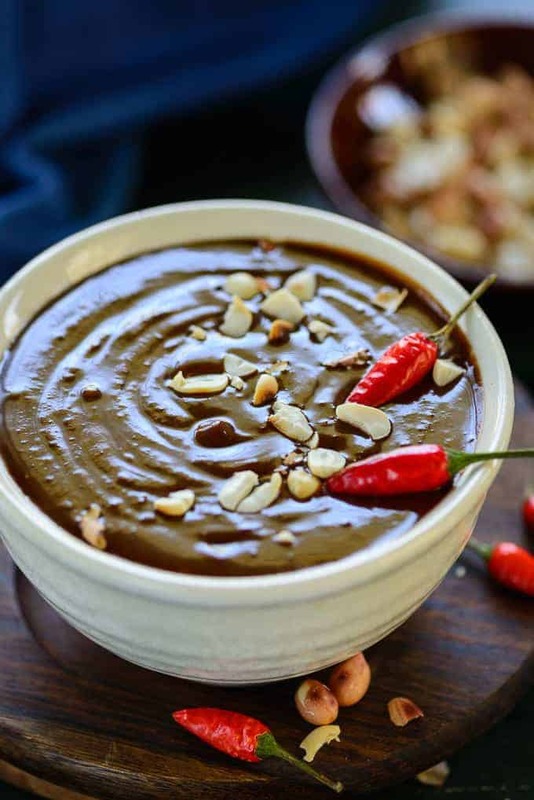 Read my simple and quick recipe to make this Best Thai Peanut Dipping Sauce at your home! By any chance if you are a Thai food lover, then you might have tasted Thai Peanut Butter Sauce at some Thai restaurant or the other as it is widely used with Noodles, Chicken satay, Thai Chicken, Stir Fried Tofu or as a dipping sauce for Spring Rolls et al. But, I always believe that nothing beats the Homemade Thai Peanut Sauce, don’t you agree? I love this recipe of Thai Peanut Sauce also known as Thai Peanut Butter Sauce because it is a very delicious recipe that can be served as a dip or helps in creating a plethora of scrumptious dishes like Thai Chicken, Grilled Chicken. This versatile sauce tastes amazing with Thai Squash Fritters as well, did I tell you? 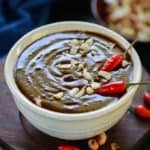 How to make Thai Peanut Sauce? Oh, it is a child’s play, telling you! All you need to do is add unsweetened peanut butter, rice vinegar, soy sauce, lime juice, brown sugar, red pepper flakes, sesame oil, ginger, garlic in a blender or food processor and blend it to a smooth paste. You can refrigerate this sauce for 5-6 days. Then, use it whenever you feel like for making a good Thai meal. If the sauce is too thick, you can add some coconut milk to it to make it thinner. You can also make a cooked version of it with coconut milk. Keep all the ingredients same and add 1 cup coconut milk in the sauce. Cook for 3-4 minutes until the sauce thickens. Adding a tsp of red curry paste or Massaman paste also adds to the flavour of this sauce. Prepare it this summer then and get ready to have a Thai extravaganza at nowhere but your home! Here’s how to make this authentic Thai sauce. How to use Thai Peanut Sauce? Apart from using this sauce as a dipping sauce with spring rolls or satay, I like to use it as a sauce for my noodles, dressing for salads and even in my stir fry. You can also drizzle it over roasted veggies. Thin it a bit and use as salad dressing. Is Thai Peanut Butter Sauce Gluten free? If you replace the soy sauce with gluten free Tamari, this sauce becomes gluten free. All the other ingredients do not have gluten. Can you freeze Thai Peanut Dipping Sauce? This recipe freeze very well. You can transfer the sauce in a freezer safe box and freeze for a few months. Just thaw it over the counter for a few hours or microwave until it comes to room temperature when you want to use. How to make Thai Peanut Sauce using Peanuts? While most recipes to make Thai Peanut Sauce calls for Peanut Butter, you can also make this using roasted whole peanuts. 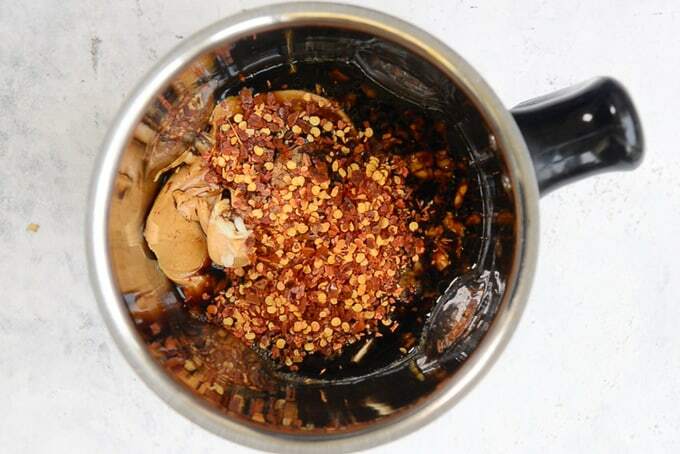 Afterall, peanut butter is nothing but roasted peanuts blended until it becomes buttery. Replace the mentioned peanut butter in the recipe with 1/2 cup of roasted skinless peanuts. Keep the remaining process same. Blend until everything comes together and the sauce is smooth and creamy. If you like coarse sauce, you can keep some pieces of peanuts coarse. Easy, authentic, vegan, this peanut-ty, no-cook Thai Peanut Sauce is a great summer side! Add all the ingredients in a blender and blend on high speed until smooth. Store in glass jar in refrigerator for 5-6 days. You can also make a cooked version of this sauce. Add 1/2 cup of unsweetened coconut milk and 1 tbsp of red curry paste to the above ingredients. Add some water and then cook the sauce for 4-5 minutes.